Great place for breakfast or a snack. They have really delicious mini-pizzas and dessert, my personal favorite is the strawberry tiramisu. Roman kitchen with a lot of meat dishes and pasta. They have a big selection of ham and cheese and it's also a great place for an aperitif. This restaurant serves Napolitan food and everything's really delicious. My recommendation is to try their antipasti-buffet. This restaurants's interior is really interesting as they designed the place in the authentic style of Trastevere and of course the food is amazing. I was lucky enough to live right next to this amazing restaurant during my time in Rome and therefore became a regular. What's special about this place is that you can choose your own meat from the fridge before they roast it. No matter if you like your steak rare, medium or well done it all tastes great. Eataly is a supermarket chain that offers a big selection of premium products worldwide. The one in Rome is the biggest one and definitely worth a visit. Apart from the big selection of groceries and beverages they also have a big food corner where you can eat quite cheap and really delicious food. I recommend their pizza margherita in the restaurant on the first floor. On the second floor you can find oysters and other seafood. This restaurant specializes in dishes with white and black truffle. Of course the prices are rather on the higher end (30 euros a meal) but it's really delicious there, so it's worth saving your money and spoiling yourself with a truffle and pepper sauce pasta. 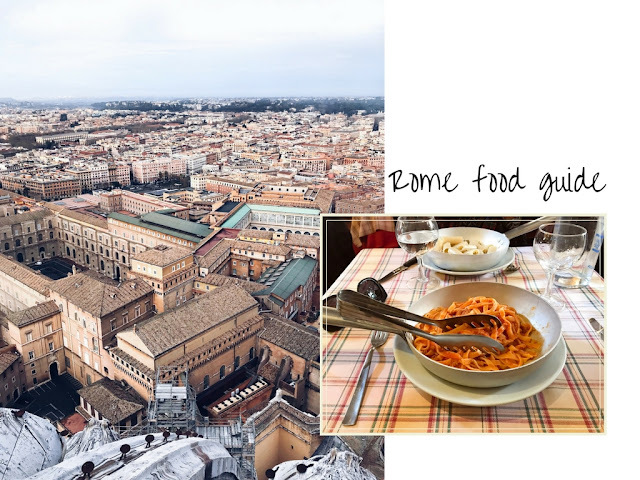 This is just a short list of restaurants in Rome that I really liked and that I felt had something to offer for everyone. But you can find a lot more nice restaurants when you just stroll around in Trastevere. Trastevere is a beautiful quarter in Rome where you can find everything: small bistros, pubs, bars and even chic restaurants. And of course one thing you can't miss in Rome is gelato! It tastes good pretty much everywhere but my favorites were Venchi, Gelateria del Teatro and Gelateria alla Scala.